Tavis Smiley offers a powerful, prescriptive successor to his bestselling Covenant series that assesses the response to crises in America -- and explores how much more needs to be done. Accountable serves as a report card that examines whether those goals have been realized and reveals how politicians and citizens have lived up to their promises and responsibilities. Accountable provides real-life examples of how crucial issues -- including health care, education, the economy, unequal justice, and the environment -- manifest themselves in our communities. Smiley demonstrates the urgent need to hold politicians and ourselves responsible, because the stakes have never been higher. 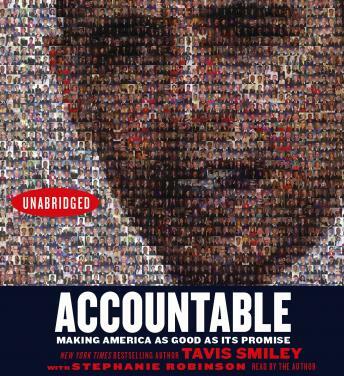 Accountable examines present-day conditions and the consequences for America. At its core, Accountable is a tool with which the community can evaluate the successes or failures of its political leaders and of itself. This insightful work acknowledges the mistakes of the past while offering hope and inspiration for a better future.